Explore el Museo de Arte Submarino en este tour de snorkel de 2.5 horas desde Cancún. Navegue a través del Caribe con su guía en un viaje en bote a alta velocidad, y luego salte al agua con su equipo de snorkel para nadar sobre más de 500 esculturas de tamaño natural sobre el fondo del mar, así como brillantes bancos de peces. El museo destaca la relación entre el arte y la ciencia ambiental, y todas las esculturas están hechas de materiales que promueven la vida del coral. Frutas y refrescos serán servidos a bordo. Buceo de 2,5 horas en el Museo Subacuático de Cancún. Todo el equipo esencial de snorkel incluido. Fruta y refrescos incluidos a bordo. Diríjase al puerto deportivo de Cancún y salude a su guía junto a su bote. Suba a bordo y diríjase al sitio de "Evolución silenciosa", una selección sumergida de estatuas ubicadas en el fondo del océano. Mire una demostración de snorkel de su guía, luego póngase su equipo y sumérjase en el océano caribeño. 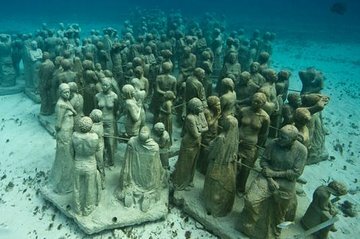 Haga snorkel durante 40 minutos y explore las 500 figuras de la exposición; vea cómo el artista británico Jason DeCaires Taylor esculpió las figuras de arcilla de pH neutro y observe la abundancia de vida marina que prospera entre las estatuas. Siéntese bajo el suave sol de México en el viaje de regreso a la marina de Cancún y luego despídase de su guía y del grupo a su llegada. Tenga en cuenta que: esta aventura de snorkel es apropiada para todas las edades, pero tenga en cuenta que el agua puede estar picada a veces. Su guía se quedará con usted para asegurarse de que se sienta cómodo. We loved the tour and everything about it. Our guide was Armando, super nice guy! This has been on my list for years and finally got the perfect weather to do it. Would def do it again ! Can't wait to try the diving next time! It was a decent experience, great crew and captain. I was under impression that we could get closer to statues but we had vests on which is understandable. Pretty exhausting experience, unable to get any pictures, I was under the impression they would have underwater cameras to take pictures for us that we could pay for, that wasn't the case. Decent experience. The guides were very hospitable and obviously experienced with leading visitors out to the waters. 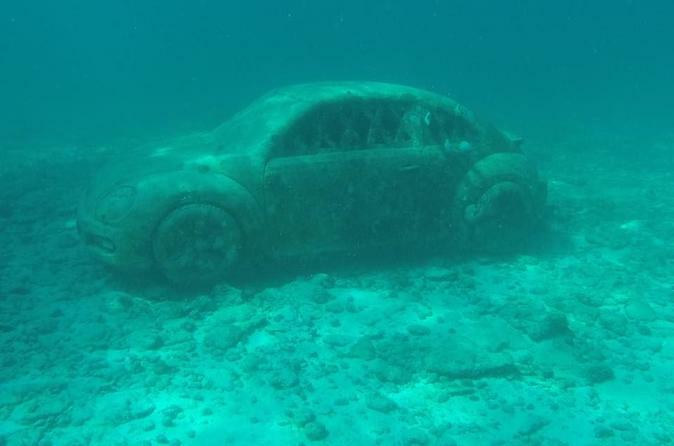 I wish we could have seen more of the underwater museum, even though we spent an hour or more in different parts of it. It's a lot bigger than what we touched, and needs more time. My favourite part was when we went to the shallow water with different corals, and all these colour fish were there. The fish followed us: schools of beautiful yellow, blue ones, and I saw a lot of other rainbow fish and small guys in the corals. I thought the fish were very friendly and then i saw on Youtube they've been trained by tour groups to accept handouts so they think tourists are gonna feed them. It's not a very environmentally friendly practice, BUT, I enjoyed that they came to follow us. It was a Disney moment. Earlier I had been on a snorkel tour of the Belize reef from Caye Caulker and saw more fish here close up than on the larger reef. This was a really excellent tour. Our tour guide, driver, and assistant were very friendly and helpful. The guide got in the water with us and showed us where to find the statues. She also would take your camera and swim closer to the statues and take pictures for you if you couldn't. When about half the boat was feeling very seasick, she and the driver altered the tour and took us to a really beautiful beach with tide pools. This was such a great decision! We were able to continue exploring around and even snorkel a little in very shallow water without continuing to feel sick. I even saw an octopus! This did not feel like a sub-par backup. It was a really excellent choice for those who were sick. I really thank the guide and driver for this decision, and I didn't have to sit out half the activities for not feeling well. 100% would recommend this tour and Aquaworld to others traveling in Cancun. This was a great tour. I wish we would of seen more statues. We seen more on the jungle mini boat tour through Cancun discount tours. We even got to driver our own mini boats. Other than that the staff were great and made trip fun and enjoyable. It was a great trip! I wish we would of seen more statues. We seen more on the Jungle mini boat tour through Cancun Discounts and we got to driver our own boats on that tour. Other than that the staff were really friendly and made the trip enjoyable. Wow! It was a fabulous snorkeling adventure and I will cherish the memories forever of our experience exploring and seeing the beautiful colorful tropical fish of all sizes and the underwater museum was amazing and could not believe my eyes at how incredible it looked. I loved the little house and the beetle bug and the many other pieces of art. Our guide was sweet and very attentive to our needs when called upon. The three member Aqua world crew was professional and great fun to be with on our journey to the Underwater Museum. What a fantastic time my family and I had enjoying that day of snorkeling and the speed boat was fun too! Thank you all for giving me and my family a safe and wonderful experience in Cancun, Mexico 2017. What an awesome experience. The boat ride was exhilarating and the underwater museum was incredibly beautiful. Our guide, Anna, was top notch in every way. She made our family trip, extra special. I highly recommend this wonderful tour.